Patricia Smith Wood began writing in earnest after retiring from a successful business career—and only after giving herself permission to call herself a writer. Her mystery novels are a weaving of creativity, research, and the knowledge she gained as the daughter of a police officer/FBI agent, as well as her own experience working for the FBI. Patricia’s first mystery, The Easter Egg Murder (Aakenbaaken & Kent, 2013), was a 2013 NM/AZ Book Awards Finalist in two categories: Best Mystery and Best First Book. 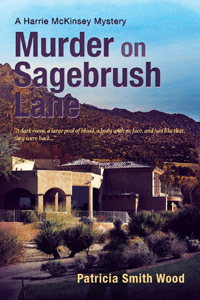 Murder on Sagebrush Lane (Aakenbaaken & Kent), her second novel in the series, was published in March 2015. The third, Murder on Frequency, is in the works. 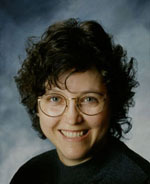 Visit her at her website: PatriciaSmithWood.com. What is your elevator pitch for Murder on Sagebrush Lane? How is this book different from the first book in the series, The Easter Egg Murder? The Easter Egg Murder was loosely based on a real, half-century-old unsolved murder in Las Cruces, New Mexico. I wanted to fictionalize it so I could solve it without getting myself in trouble. Murder on Sagebrush Lane started with one tiny thing I’d read about years ago, and from that I created a story to go with it. Along the way, I incorporated another tidbit I accidentally came across while researching, but there was no attempt to tell a fictionalized version of a true story in the second book. What makes your Harrie McKinsey Mystery series unique from other cozy mysteries? I don’t think there is another cozy series whose protagonist is an editor. That simply started as a device—a way to get her involved in solving a mystery. As it turns out, it also gives her free time in other stories to pursue her new hobby of solving crimes. Which character in the series have you enjoyed writing the most? What are the challenges of writing a novel series? When I finished the draft of the first one, I had no intention of making it a series. During my first successful meeting with an agent (and I use that term somewhat loosely because the “success” was only that she asked to see the first 50 pages! ), I was caught by surprise when she asked if it was a series. My mind did a double flip, and I found myself saying, “Oh, yes. It definitely is!” So that became the challenge. How do I carry on with some of these people I’d just created, when I hadn’t planned to do so? I started out giving Harrie McKinsey the characteristic of slightly prophetic dreams. In the second book, that comes out briefly in the beginning, but doesn’t run through the rest of the story. I don’t know if that will be a factor in the third one or not. I’m sure Harrie will tell me if it is! I’d be happy to have a reputation for giving the reader a tight, quick-paced story that leaves them wanting more when they finish. Is there something you know now about the writing journey that you wish you had known when you first started? I wish I’d truly known, in my bones, that I didn’t have to have all the answers before I started. I came to realize that “starting” was really the beginning of “learning” how to do it. Without ever starting, you can’t possibly learn the steps along the way. It’s so true that the only way to improve is to simply sit yourself down and start—no matter how bad you may think it is. You can only get better by actually “doing” it! And by the way, I made this monumental discovery when I attended my first SouthWest Writers meeting. I “got permission” from the people there to call myself a writer because I was actually writing. That was my first big step in learning how to improve. What is the greatest tool in a writer’s arsenal? A really good, compatible critique group. There’s nothing like surrounding yourself with people who will give you the unvarnished truth, and yet encourage you by pointing out the good things you’re doing. When you have people like that, whose opinions you value and trust, you can do amazing things. I’m confident that’s why The Easter Egg Murder was a finalist in the 2013 NM/AZ Book Awards in the categories of Best Mystery and Best First Book. I hate deadlines, but I do my best work when the pressure is on to produce. And often that pressure comes from my critique group. I’m a “panster” so I sit down (often the night before a critique group meeting when I’m expected to bring something to read) and I produce. I let the characters tell me what’s going on in the next chapter. You’d hardly call it a routine, but it seems to work for me. Why did you choose Aakenbaaken & Kent to be your publisher? Largely because they were the first ones to ask me! I wish there had been a vigorous competition amongst the five top New York houses to snap me up, but alas, that was not the case. They also came highly recommended to me by an award-winning writer, whose opinion I trusted. I’ve been well treated, and they’ve helped me tremendously. I’m working on the third book in the Harrie McKinsey Mystery series. Because I’m an amateur radio operator, my fellow hams have asked when I intend to include something about that hobby in the books. So the next book will have a touch of “ham” flavor. It’s called Murder on Frequency. I’d have to say, if it’s your dream to be published, don’t give up. In today’s world of books there are so many ways to achieve your goal. But always (and I can’t stress this too much)—ALWAYS—make sure that what you submit is clean, professional, highly edited, and free of typos and slop. If you end up publishing it yourself, you’ll have half the battle done if you’ve made sure it’s truly ready before you let it out of your hands. Thanks for interviewing me, Kathy. It was fun and I appreciate the promotion.